Hi there! Here you can read excerpts of my novels, purchase books, read news about upcoming events and signings, plus much more! After a much-deserved rest, post-PhD, Paul has been hard at work polishing up his latest novels and recently completed new and final drafts of three of them: My Name is Vengeance (Draft 7 completed 7/21/2016); The Spiritar (Draft 7 completed 9/28/2016); and Lost Boy (Draft 6 completed 11/4/2016). On Monday, July 6, Paul learned that his amended PhD thesis had been approved by his internal examiner. On Tuesday, he arranged to have his thesis printed and bound, with two copies to be delivered to the Lancaster University library. This is the final step required before his degree will be officially conferred. Paul Passes PhD Viva with Minor Amendments! On Wednesday, March 4, 2015 Paul successfully defended his PhD thesis before a board of examiners in Lancaster, England. His pass is subject to him completing "minor amendments" which he is being granted 6 months to complete. Paul Submits PhD Thesis "Lost Boy: Exploring Fictional Worlds"
Paul submitted his 390-page PhD creative writing thesis to Lancaster University, UK on April 3, 2014. This thesis includes the full novel "Lost Boy" as well as a 42,000-word critical commentary. To see more past events & news, click on more . . .
Michigan Horror -- Feel the Fear! The Sarasin family's move to northern Michigan is meant as a getaway from the stressful big-city life of suburban Detroit. Instead, they find themselves engaged in an epic struggle . . . with a demon, their new house's sinister past and with themselves. From a mysterious stranger who stalks them, to a hotel clerk who describes their house's former owner as "a doctor not of the living . . . but of the dying," from sounds of digging and voices under their house to an enormous "stone circle" used for Satan worship in the forest behind them, from the discovery of journals describing demon calling to a sheriff who may be "one of them," the Sarasins are plunged into a seemingly unstoppable descent as pawns in a game where the future of the world depends upon their ability to stop the creation of an immense "gate"--a portal between the world of the living and that of the revengeful dead. 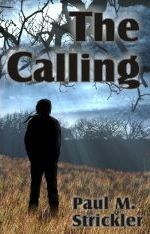 Interested in "The Calling" screenplay? The Calling is a 500-plus-page-long, character-driven, lyrically-fluid tale that reads like a haunted house story with a Halloween funhouse ride-type pace that sometimes gets stuck in narrative before it starts off again and pulls you further into the ride. The way Strickler writes tells me he knows what he's doing, like he's written for awhile, though this is his first novel. I've said that before with other premiere writers who have put out first novels, and this is a way well-over obvious indication the chap's not only got some real talent, but the ambition of someone who believes in his work and the patience and diligence to pull out of himself a story so epic yet dealing with so tight a group of characters in a small town setting. Yes, it rides on Essence of King, of whom I'm certain is an inspiration to the author, but Strickler is his own voice here. Basically, with this story, you've got a family who moves to a small town in northern Michigan and into the one house nobody in that town wants to live in. A guy who once lived there was very much into the Dark Arts, you see, and what happened there was so powerful that it wants to happen again, pulling the main character of the boy in the family further into intrigue, seduces him to discover just what it is that's happening to his family to find himself immersed smack down in the center of it. As it turns out, important people in the town are involved, and we find the source of unspeakable evil to be from a supernatural gateway where all the protagonist pieces are shuffling together throughout the story to eventually open and bring about a vengeful assault from the demonic forces beyond. Paul Strickler has an impressive educational and professional history which largely involves the side of the brain that's opposite the creative side, working high-ranking positions in areas ranging from CIA computer operations to aerospace technology, which accounts for a good head-on-your-shoulders literary expertise and actually stimulates creativity, is what it seems to me in his case. I mean, a majority of computer geeks I know have a skill equivalent to a gerbil playing basketball when it comes to telling a story on paper, and Paul not only tells a story, but tells it well, and places enough dark and surreal visions in your head that it takes a few good nights of restless sleep to get over. Bravo, and keep up the great work, Paul…….